I cannot tell you how excited I am just typing the word Spring! On Friday I shared our spring table setting for you and I am going to pop in a couple more pictures of that here. 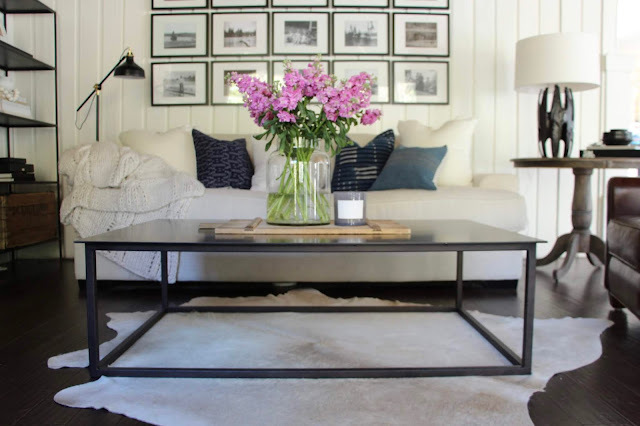 I really think fresh flowers are the best most inexpensive way to add that touch of spring to the inside of your home. I usually pick them up once a week when I go to the grocery store. I have found Trader Joes to be the best source for them, as they are the best price and the biggest variety. These foxgloves I picked up at Trader Joes and they add the much needed pop of color on our coffee table. This time of year I start to crave color. When everything is so dreary outside and it gets dark so early, I just want that little bit of happy in the home. Flowers do that for me. I added some blue pillows to the couch to keep things from looking to monochromatic as well. I love the mix of light blue, navy, and indigo. I still like to curl up on the couch with a big blanket, even year round, so one is always nearby. This is the one I have and I love it. This sweet little pillow is from Oliver and Rust. You saw the dining room on my last post, but here is another peek at that in case you missed it. On the sideboard I didn't do much, just a few speckled eggs from the dollar store in a vintage ironstone dish. You can find that wire basket right here. I have them all over, I love them.